Couture's figurative paintings possess an edge of mystery and foreboding. 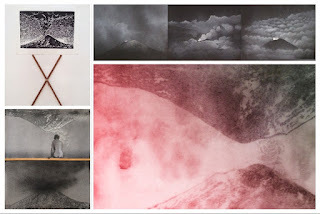 Her subjects range from children and infants that are inspired by Victorian photography, to other natural phenomena such as icebergs, volcanoes, and her own backyard. She has lived and exhibited in Mexico City over a period of 40 years, and owns a small rooftop studio in the historic downtown with a splendid view of the volcanoes. She was a friend of the late author Raul Ortiz, who translated Under the Volcano into Spanish.